The Raoul Wallenberg Foundation is proud to present the Armenian version of “Ambassador Morgenthau’s Story” in digital format. (E-Book). Henry Morgenthau (26 April 1856 – 25 November 1946) was born into a Jewish family with a decisive political position during Franklin D. Roosevelt and Theodore Roosevelt administrations. He was a lawyer, businessman and United States ambassador, most famous as the American ambassador to the Ottoman Empire during the First World War. Morgenthau has come to be identified as the most prominent American to speak out against the Armenian Genocide. Ambassador Morgenthau’s Story is the title of his memoirs, published in 1918. The book is a primary source regarding the Armenian Genocide, and the Greek Genocide during the last years of the Ottoman Empire. Although the safety of American citizens, mostly Christian missionaries and Jews, was a major concern in the Ottoman Empire early in his ambassadorship, Morgenthau stated that the one issue he was most preoccupied was the Armenian Question. As Ottoman authorities began the extermination campaign of the Armenians in 1914-1915, Morgenthau’s desk was flooded with reports nearly every hour by the American consuls residing in different parts of the Empire, documenting the massacres and deportation marches that were taking place. Morgenthau held high-level meetings with the leaders of the Ottoman Empire to help alleviate the position of the Armenians but his protestations were ignored. As the massacres continued unabated, Morgenthau and several other Americans decided to form a public fund raising committee that would assist the Armenians, the Committee on Armenian Atrocities (later renamed the Near East Relief), raising over $100 million in aid, the equivalent of $1 billion today. Looking back on that decision, in his essay The Murder of a Nation, he wrote he had come to see Turkey as “a place of horror. I had reached the end of my resources. I found intolerable my further daily association with men, however gracious and accommodating…who were still reeking with the blood of nearly a million human beings.” In 1918, Ambassador Morgenthau gave public speeches in the United States warning that the Greeks and Assyrians were being subjected to the “same methods” of deportation and “wholesale massacre” as the Armenians, and that two million Armenians, Greeks, and Assyrians had already perished. Later, in 1943, his son, Henry Morgenthau, Jr. United States Secretary of the Treasury, approved the World Jewish Congress’ plan to rescue Jews through the use of blocked accounts in Switzerland. In January 1944, Morgenthau obtained the presidential creation of the US War Refugee Board that sponsored the Raoul Wallenberg mission to Budapest and allowed an increasing number of Jews to enter the U.S. in 1944 and 1945. As many as 200,000 Jews are believed to have been saved in this way. As a corollary to this presentation we recall that on 9 January 2014 the Wallenberg Foundation paid a visit to Robert Morgenthau, grandson of Henry Morgenthau, Sr. and himself a distinguished public servant who held the position of county prosecutor in New York from 1975 to 2009. The aim of the visit was to thank the humanitarian role played by his father and grandfather. Moreover, on 30 September 2015, the President of Armenia, Serzh Sargsyan, took part in a reception held by the International Raoul Wallenberg Foundation at the United States’ Congress in tribute to Henry Morgenthau, Sr. The Wallenberg Foundation is proud to have this book among the prestigious titles that comprise its e-library and encourage its followers to read a work that constitutes an essential narrative to understand the facts of a decisive chapter of modern history. This version in Armenian has a place in our digital library, along with the original English version, published in 1918. 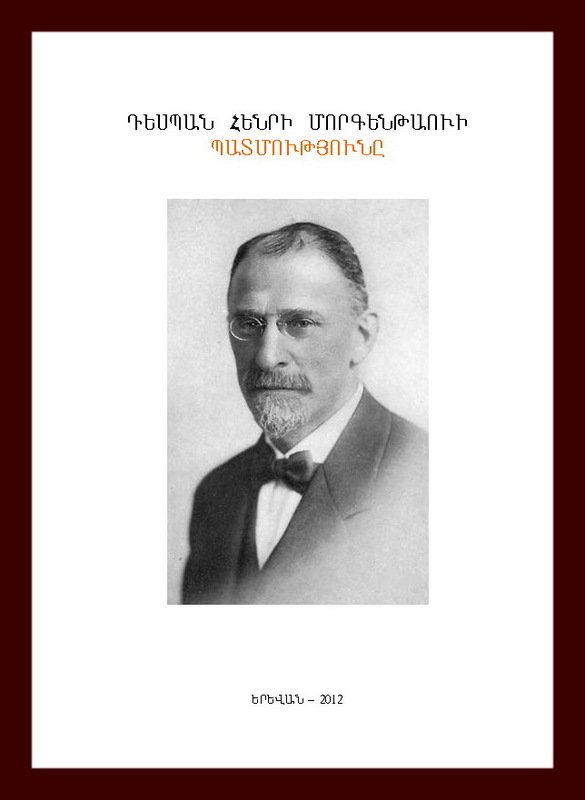 The Raoul Wallenberg Foundation thanks Mr. Hayk Demoyan, Director of the Armenian Genocide Museum-Institute in Yerevan, Armenia, for providing a copy of the book in Armenian language.